An unprecedented 20 million people today are on the precipice of famine. At the heart of this crisis is Nigeria, where a seven-year-long conflict triggered by the insurgent group Boko Haram has wreaked havoc on the northeastern corner of the country. The violence has uprooted millions from their homes and decimated trade and agriculture. As a result, more than five million people are unable to feed themselves. 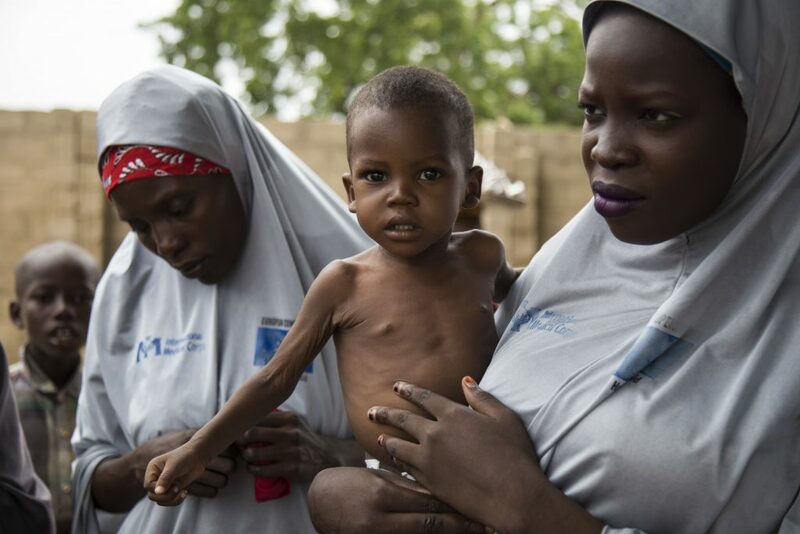 Two million of them are estimated to be malnourished, including more than 700,000 children under age five with life-threatening severe acute malnutrition. 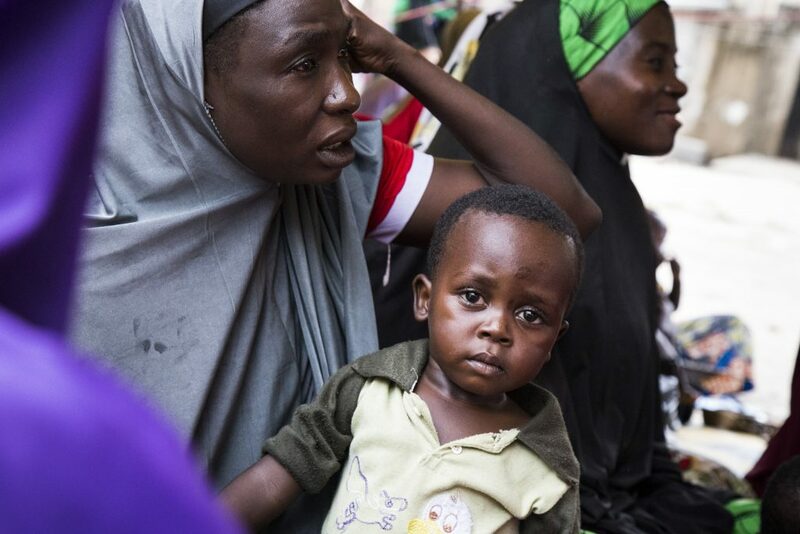 The epicenter of Nigeria’s deepening food crisis is Borno State, where the Boko Haram began in 2009 and continues to carry out attacks on civilians and control islands of territory. The state capital, Maiduguri, has seen its population double from one million to two million, as people flee violence in other parts of the state. The influx has put an enormous strain on already impoverished communities, making even basic food staples harder to come by. 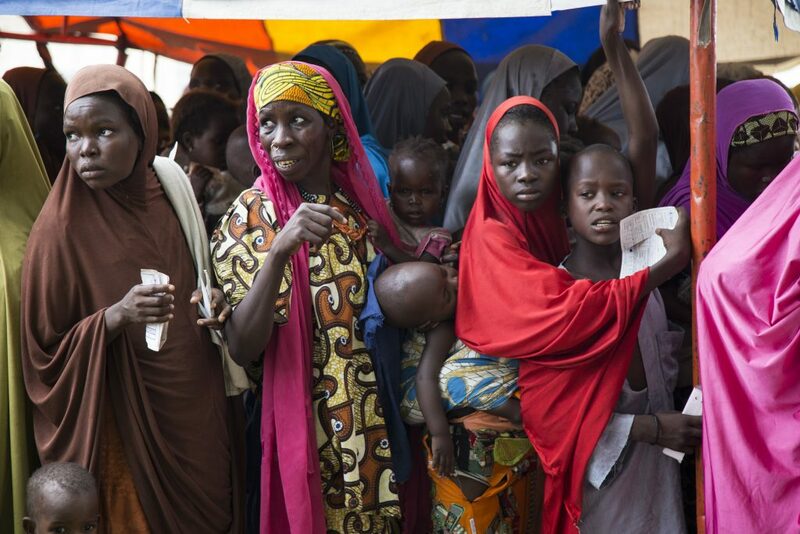 International Medical Corps, with support from the European Civil Protection and Humanitarian Aid Operations (ECHO), is running nutrition clinics at 11 sites across Maiduguri. Since March 2017, these sites have collectively provided preventive and curative care to approximately 3,000 children with severe acute malnutrition. They have also reached 16,600 pregnant and breastfeeding mothers with information about healthy infant and young child nutrition. The organization is also distributing vitamin-fortified food to children and pregnant and breastfeeding mothers together with the World Food Programme in an effort to prevent malnutrition. 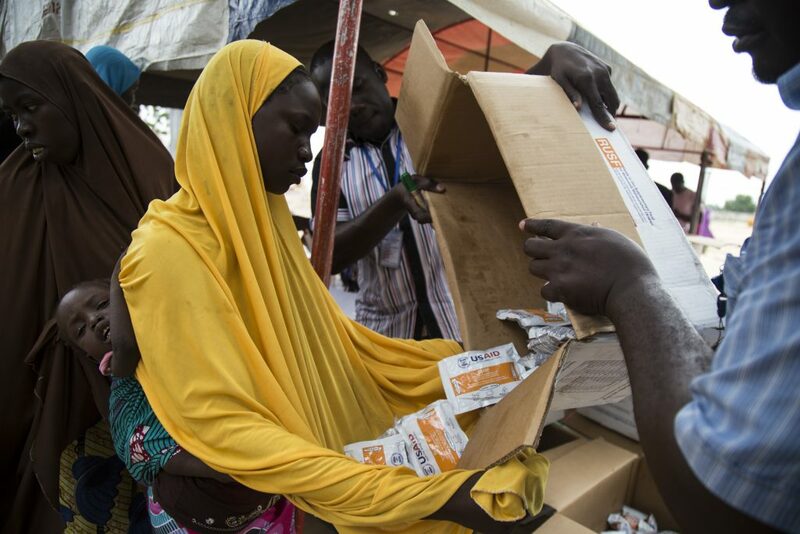 International Medical Corps, together with the World Food Programme (WFP), organizes a distribution of nutrient-dense foods for children six to 24 months of age at NYSC Camp in Maiduguri, the capital of Borno State. The distributions take place each month and are meant to prevent children from becoming malnourished. A mother receives her ration of supplemental food, which she will give daily to her children who are between six to 24 months of age to add essential vitamins, minerals, and nutrients to their diet. 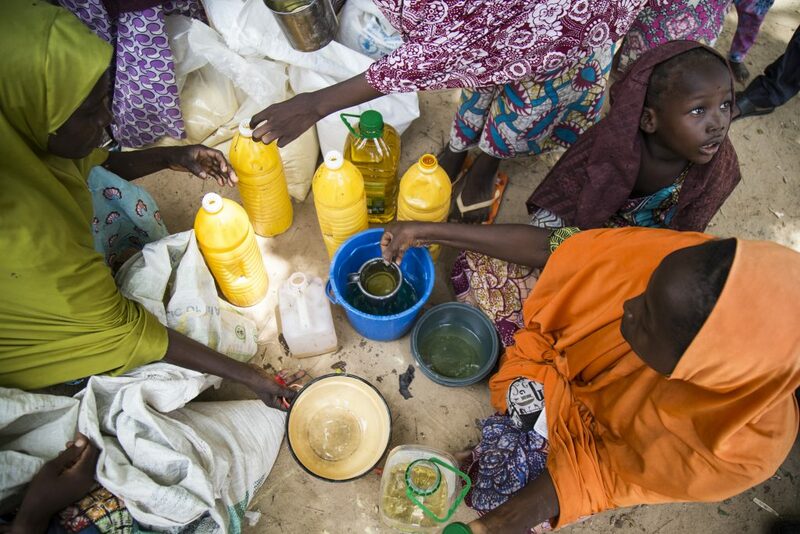 Women divide up their rations of vitamin-fortified oil and flour following an International Medical Corps distribution at NYSC camp. 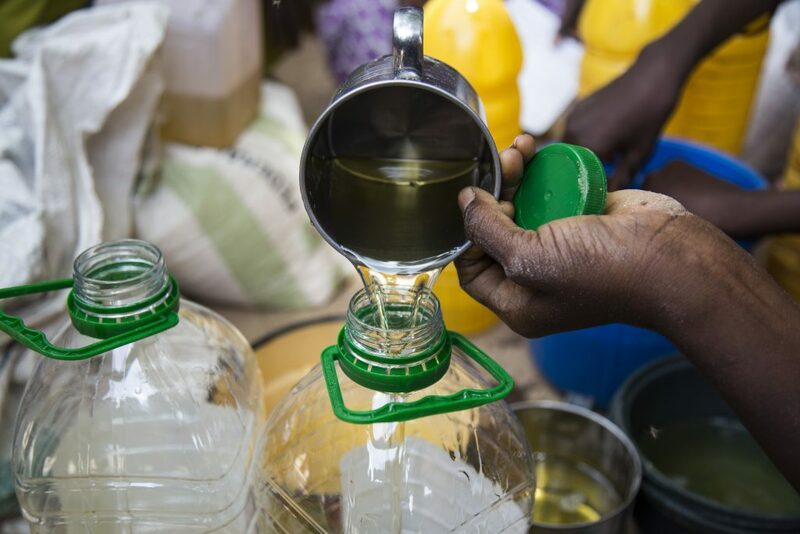 The oil and flour rations are given to pregnant and breastfeeding mothers each month in an effort to keep them and their children well-nourished. Mothers are divided into groups of 10, who then split up the rations so that each get 750 ml of oil and 7.5 kg of flour a month. As of early August, just more than 200 mothers received food rations from the distribution at NYSC Camp. 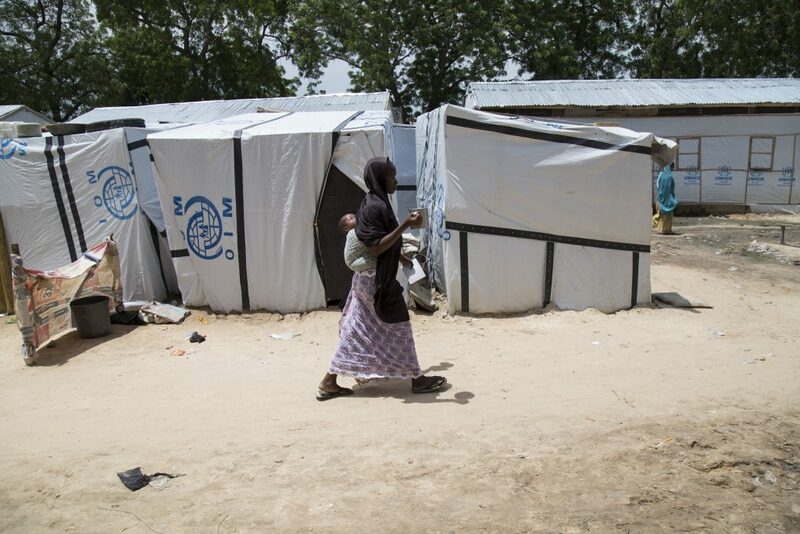 Aisha, a mother of four, walks back to her shelter in NYSC Camp with her monthly ration of oil and flour. She and her family fled their home in Borno State in northeast Nigeria when Boko Haram attacked, forcing them to travel first by foot and then by truck to reach Maiduguri. 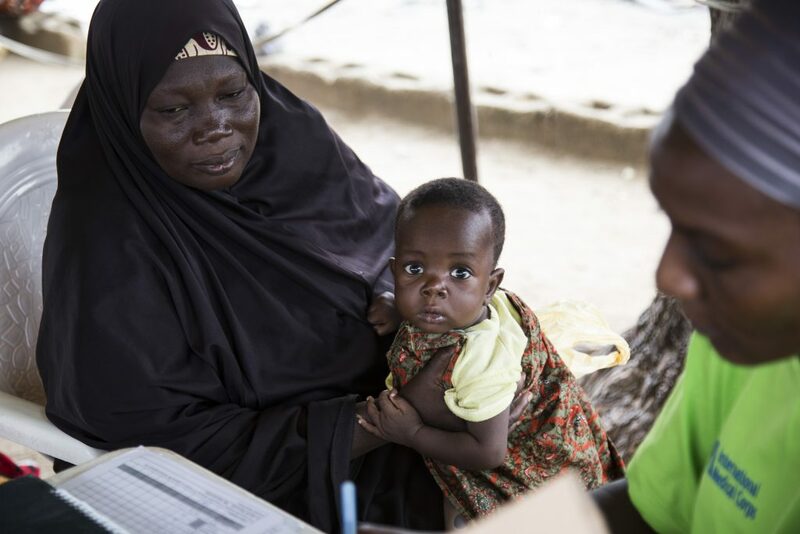 Mothers and caretakers bring children to be screened and treated for malnutrition at International Medical Corps’ ECHO-funded outpatient nutrition clinic in Mairi Kuwait, a neighborhood in Maiduguri. 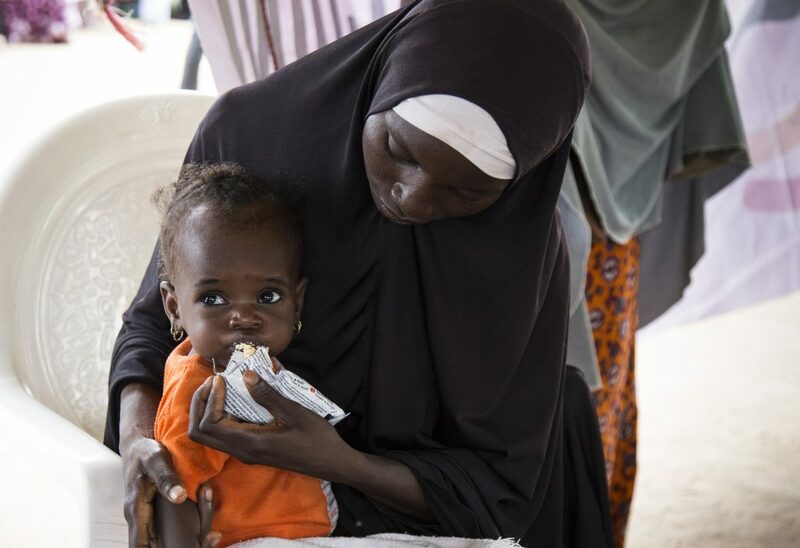 One of International Medical Corps’ community health volunteers holds a severely acutely malnourished child at the nutrition clinic in Maisandari 2, a neighborhood in Maiduguri. The community health volunteers check children’s mid-upper arm circumference and weight before sending them onto a clinician for a more in-depth check-up. A child is admitted to International Medical Corps’ nutrition program in Maisandari 2. The nutrition clinic cares for mostly host community members and is currently treating approximately 190 children acutely malnourished children. 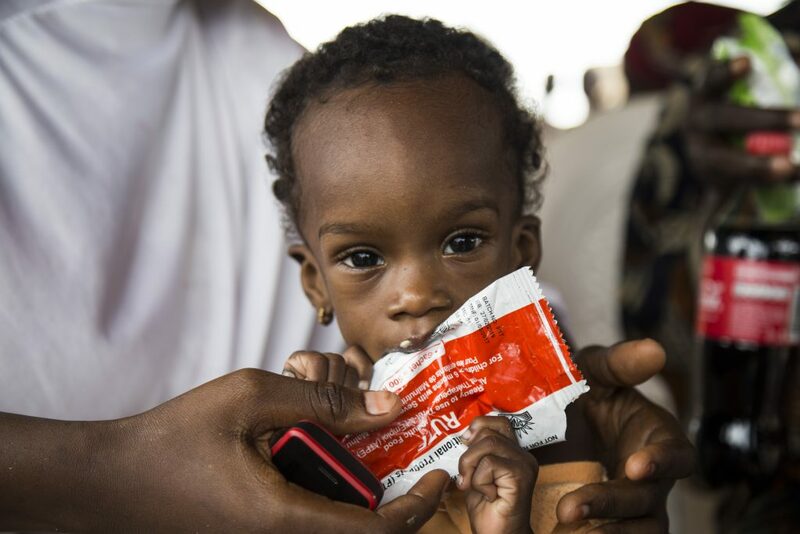 As part of the admission process, children are given a sachet of RUTF to test their appetite. Children who have a good appetite can be treated as outpatients, while those who refuse to eat will referred to a stabilization center for around-the-clock care.